Sue Pelletier is new to Holliston Mill Studios but she is not new to the art world. She has a BA from St. Michael’s College and an MFA from Pratt Institute. Her 26 years of experience teaching K-5 in Dover, MA keep her connected to the children who often inspire her work. 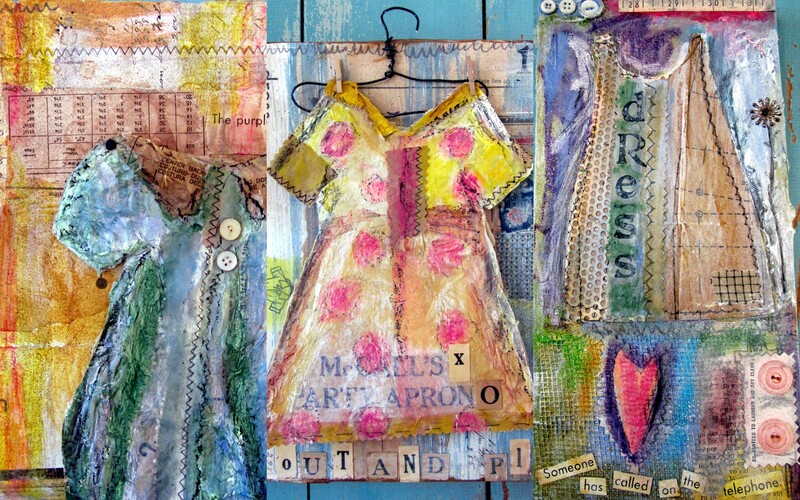 She has taught at mixed media retreats around the country as well as at smaller studio venues. Sue occupies a newly renovated studio at the mill. My expectation was to walk into a pristine room with freshly painted walls. It was all that, but the explosion of colors and the energy of her work overpowered the serenity of the space in a wonderful way. Her colorful materials crowd a worktable. The numerous mixed media pieces, leaning against the walls, waiting to be hung are happy and joyous and made me smile. Sue is a mixed media artist who works with plaster, modeling paste and heavy matte gel medium to create textures. The images in her work come from her own childhood and that of her two children. Dresses, words, numbers, birds, shoes, and houses are recurring images in her work. She also uses words, scribbled in, sometimes legible, sometimes not. She may read or see something that strikes a chord and uses that as a starting off point to create, often with a humorous point of view. 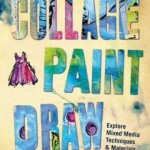 F&W Publishing recently published Sue’s book, COLLAGE, PAINT, DRAW. The book is project based, focusing on mixed media techniques. The writing took close to eighteen months and drew Sue away from her painting. She calls it a breather and is now ready to get back to work on her painting. Sue has also produced two technique DVD’s with Interweave Press, Texture Build Up and Preparing to Paint. Her work has been published numerous times in Cloth Paper Scissors and in Somerset Studios.